Last time I visited Shipeshewana, Indiana I walked over to the antique mall to have a look. It was summertime and it was hot. I had shot my wad at the fabric department at Yoder’s and I only had an hour to look around, looking being the operative word. There were all sorts of treasures to examine, including a wonderful old crazy quilt. It was very past its prime as much of the fabric was disintegrating. Several pieces were in shreds. I nosed over to see if there was a date anywhere. Indeed there was! It was on a ribbon of some sort, right at the bottom. The year was 1891! Wow! 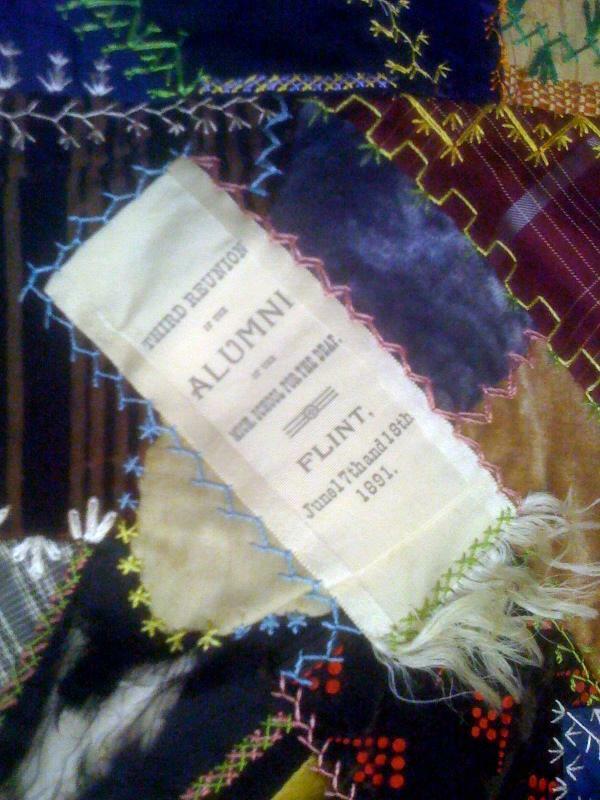 And then I noticed that the ribbon commemorated a reunion for the Michigan School for the Deaf in…. That’s my town. I could hardly believe my eyes. There was nobody around I could even elbow to share this with. No camera; all I had was my cell phone. But how cool was that?! That is awesome. That would have been really tempting to me to buy it. Then I would show it to everyone I knew. i can’t believe you didn’t pull out a credit card, or barter a pint of blood for it! Did you buy it? I would have for sure! We were just in Shishewana last week, but unfortunately, a lot of the businesses for shut down for the winter. What a find!!! It would be so tempting to want to buy – but like you, I’d probably already spent my wad at Yoders too… so a pic will have to suffice. It sure points out the importance of labeling our quilts, doesn’t it? 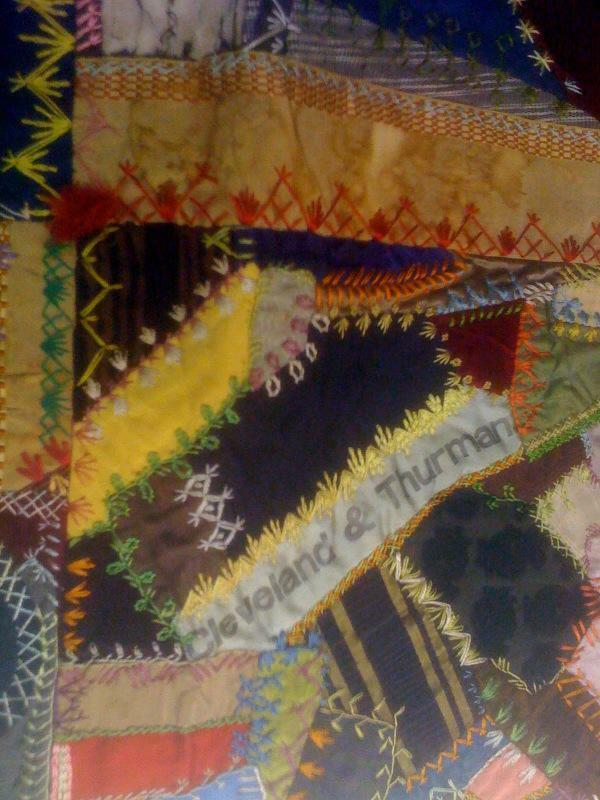 I have a question: I have several quilts of my mother’s, but don’t know when she made them I would like to document her work for future generations – do you have any ideas of what kind of label I could apply, or how to word it? Thanks for any advice! Hey! I guess I will have to pay more attention to who is around me next time I visit Shipshewana. My brother lives in Indiana and we make a trip to Shipshewana each time I visit. I always go to the antique mall and always go to Yoders. I have recently gotten interested in spinning so also visited D’Vine Gallery. If you haven’t found them yet be sure to visit their gardens outside the shop after you browse. They are spectatular! So……. Ami……… how much were they asking for it ? The THIRD reunion… so this person attended, or graduated from, the Michigan School for the Deaf in 1888??? Wow I wonder if they would like that qult hanging someplace in their school….? Are they still out there on Miller Road with all the trees on the grounds and the Dean’s house next door ??? And you DIDN’T buy it??? How cool is that. I think I really need my phone to take pictures! Aren’t those unexpected, “I don’t really have the time to look” moments the best? Some of the best treasures are the found treasures! Go figure! That was great! My hometown too! On the same note….when I was a teenager, I gave my mom a cute little framed wall hanging that I had hand-embroidered from a kit – my first one, I think. She had it hanging in her kitchen for as long as I could remember. After several moves to smaller accomodations, I lost track of the picture. Then about 8 years ago I was in a local antique mall and in one of the little nooks and crannies I saw something that reminded me of it….and upon a closer look, I discovered that it was MINE! My initials and date were clearly visible. When I asked my mom about it, she sort of smirked and said that it must have gotten stuck in a box and mistakenly got donated to Good Will. We laughed about it for a long time! Good thing you’re still on speaking terms! Ouch! You bought it, didn’t you? And gave it to the school? The colors in the photos looked so vibrant for such an old quilt. Did you ask the owner of the shop to let you know what happened to the quilt? I am so curious just reading about it and seeing the small photos. Thanks for sharing your experience. I am totally impressed with the embroidery. How beautiful. Consider me elbowed. This is too cool. I just love things like this. Did you bring it home? What a fabulous find! And superb stitching. Do hope you told the school for the deaf of this so they could consider buying this if they want it. What a treasure. Ami. I live in Jackson Mi. and have never gone to Shipshewana. But it I’ll go there this spring for sure! And I’ll take my camera. Thank you for sharing yor pictures, Ami. It’s the unexpected things in life that keep us interested. It was nice of you to share with your fans and friends. OMG! This underscores the necessity of labeling all of our creations, doesn’t it? Spectacular. I see others have asked the same question – You did buy it ,didn’t you? ! That indeed is a rare but wonderful find. I think I would have gone into DEEP debt to purchase that quilt! Even if it was in shreds. I hope you reconsidered and bought it! I would have had to try to buy that quilt and return it to the school. I t is a very integral part of their heritage. You really just elbowed all of us!! I have feltt the elbow in my ribs! !